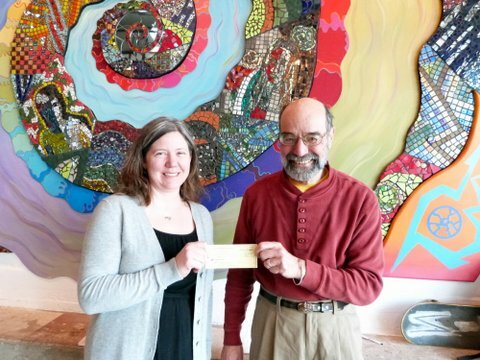 On March 7, 2013, OWLA treasurer Steve Lopes presented a contribution of $1000 from the Old West Lawrence Association to Jennifer Roth, president of the Pinckney PTO. The contribution is in support of the Pinckney tunnel permanent mural installation project, a joint undertaking of the PTO and Van Go, Inc. This is a reminder of the meeting on Saturday morning to learn about the upcoming vote on the school bond issue. Please join your neighbors to learn about and ask questions on the proposed the bond issue. If you are walking to the meeting from south of 6th Street, by using the tunnel to reach the school you will gain an insight to the site of the permanent mural installation planned for the tunnel. The project is a collaboration between Pinckney PTO and Van Go. It is unrelated to the bond issue, but OWLA is supporting it financially.